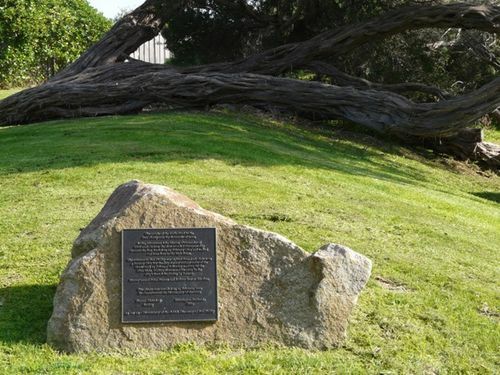 A monument commemorates the bicentenary of the British Discovery of Port Phillip in 1802. On 4 January 1802 LIeutenant John Murray sighted Port Phillip but found the entrance dangerous and decided to survey it later. He charted the east coast of King Island, then returned to Port Phillip on 31 January and sent John Bowen into the bay in a launch to examine it. Murray entered Port Phillip in the Lady Nelson on 14 February and anchored inside. He named various landmarks: Arthur's Seat, Swan Island, Point Paterson and Point Palmer. On 8 March he took possession of Port Phillip, which he named Port King and which King renamed later. Excerpt from John Murray, Australian Dictionary of Biography. The people of the Kulin lived in the Port Phillip area for thousands of years. Acting Lieutenant John Murray, Commander of HMS Lady Nelson, the first recorded European ship to enter the bay, landed of 14 February 1802 and walked out from here to the high dunes. The entrance to Port Phillip was sighted from Lady Nelson on 4 January 1802 but the ship did not attempt entry of the heads until 14 February following a survey by the First Mate, WIlliam Bowen and his party in the ship`s launch beginning 31 January. Murray named Point Nepean and Arthurs Seat at this time.